Χριστός ἀνέστη, Христос воскрес, and Happy Easter to those who celebrated yesterday! Today, in honor of Easter in the Greek Orthodox religion, we will honor a certain Greek diva you may have heard of for our first ever #MariaCrushMonday, instead of our usual #SingerCrushSunday. Maria Callas was a fearless diva who broke the mold of what an artist could and should be. Her legacy as an artist, singer, and woman will forever leave a significant mark on the opera world. Her life was quite dramatic on stage as well as off, and both her professional and personal lives had “lead roles” in the public eye. She was nothing less than iconic, and Leonard Bernstein even said she was “the bible of opera.” Due to her celebrity status during her lifetime, she faced plenty of criticisms, and the media would report with their own negative opinions on her weight, her love life, her performances, rumors of temper tantrums backstage, etc. She was often a target, but she was a strong woman, and handled all of it as gracefully as humanly possible. Who do we remember today? 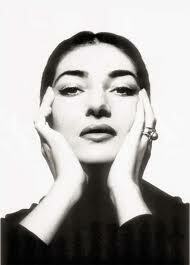 Callas, not her critics. #MariaCrushMonday aims to leave you with a notable quote from La Divina herself, and of course, a timeless operatic interpretation. This week we will be featuring “Vissi d’arte” which literally translates to “I lived for art” from Puccini’s Tosca, a role that is historically associated with Callas’ interpretation, and a character that is often described as courageous. Do me a tiny favor today: open your Pandora or Spotify and listen to anything Maria Callas. She was an amazingly talented Greek American singer with a tragic life.